An inside look into former Aetna CEO Mark Bertolini's book, "Mission-Driven Leadership: My Journey as a Radical Capitalist"
That was the first thing that Mark Bertolini said to me. It was the fall of 2015, and I was meeting with Bertolini, the chairman and CEO of the Aetna Corporation, about a possible collaboration on a book. The project seemed like a long shot. The insurance industry is not known for dynamic leaders, but Bertolini had established himself as a maverick: he had raised the minimum wage for employees, introduced yoga and meditation into the workplace, and even paid workers to get enough sleep. He’d go to work in blue jeans, he liked riding motorcycles, and he was the first straight ally on the National Gay & Lesbian Chamber of Commerce. A different kind of CEO. In preparing for the meeting, I had read what Bertolini thought about health care – it costs way too much, the results are often lousy, and the disease that imposes the highest costs with the worst outcomes is diabetes. Bertolini wanted to overhaul the entire system, but we’ll never fix health care until we fix diabetes. That’s one subject I know something about, so when I introduced myself, I told Mark that I’d had type 1 diabetes for 38 years. I believe that surprised him. Aetna covers more than 35 million people around the world, so when Mark hears diabetes, he thinks about the spiraling costs and complications, which are usually associated with how long someone has had the disease. The longer you’ve had it, the more likely you’ve developed problems, and if you’ve had it for nearly four decades, something has surely gone awry. Even if this project bombs, I figured, Mark now knows that type 1 diabetes and good health – over many years – are not exclusive. 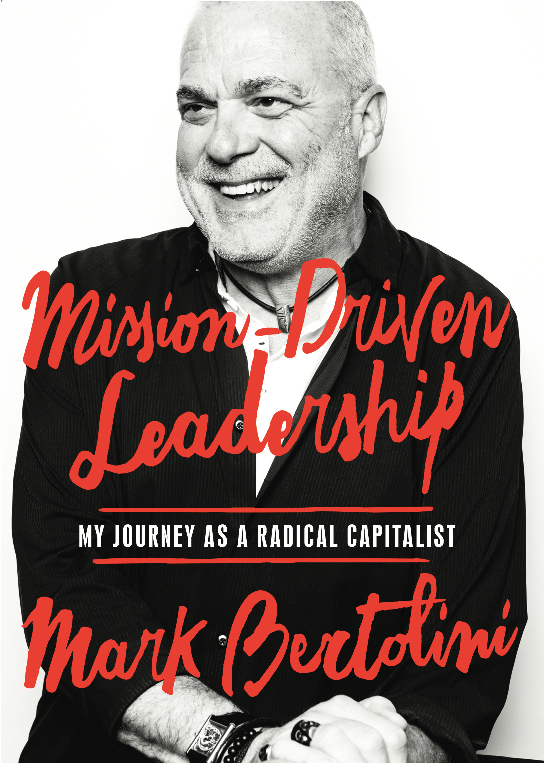 The book, “Mission-Driven Leadership: My Journey as a Radical Capitalist,” was published this week under Mark’s name. My collaboration with Mark was also quite a journey – while working on the project, Aetna was sued by the DOJ, Aetna was in the crosshairs of the Affordable Care Act controversy, and then Aetna was acquired by CVS in a $69 billion merger. Mark was in the middle of all of it, but the book itself, as I saw it, was really about how Mark overcame two personal crises: his teenage son was diagnosed with incurable cancer but survived in an eleventh-hour miracle; and Mark himself was in a ski accident that left him in a coma for six days, and when he awoke, he had a permanently disabled left arm that was beyond the care of Western medicine. Those experiences changed Mark, for the better, as a person and a leader and is what makes his story both inspirational and memorable. That said, the book should be read by anyone who is interested in diabetes. Mark devotes a lengthy chapter to health care and targets diabetes as a daunting but solvable problem. Unlike academics, pundits, or researchers, Mark has been in the trenches, and his success at Aetna – specifically in investing in patients to keep them healthy and in reducing expenses for them and the company – is proof that his ideas work. At his nadir, Mark left his house late one night and drove his BMW 120 m.p.h. through Connecticut, with serious consideration of suicide. How he survived that night – and how he reinvented himself physically and emotionally – is part of the story, and I would have never understood it had I just interviewed him on the phone. At lunch one day, he had a bag of chips, but because he can’t use his left arm, he had to open the bag with his teeth. That’s is in the Prologue. Another time, I saw him when it was raining, and he was in discomfort. Because of his spinal cord injury, his arm flares with pain when the barometric pressure drops. That’s in the Epilogue. You also invest in your customers . . . which brings me back to diabetes. Mark understood that of the $327 billion that our country spends on diabetes each year, only a small fraction of that – 15 percent – is spent on medicine and supplies. We spend most of our money when things go bad: ER visits, hospitalizations, surgeries, medications to treat complications. Leave aside the human impact. If all you cared about was the money spent on diabetes, you would devise a system that reduced those bad events. That’s what Aetna did under Mark, and it was really just the first step of a broader rethinking – or even reimagination – of health care in America. The core issue is, how do we keep people well instead of just take care of them when they are sick. In that light, people with diabetes are the primary example of how making investments in wellness will yield the greatest benefits. Two provisions in Mark’s thinking stand out. First, compared to other countries, the United States significantly underinvests in social determinants, or the things that most influence our health – from unclean water to unsafe streets, from the prevalence of drugs to the absence of nutritious foods. The implications for diabetes are obvious: if you want to be healthy, you need access to healthy food, you need parks and bike paths for exercise, you need safe streets so you can take a walk each night. Those basic amenities are missing in our poorest communities and are contributing to the growing socio-economic divide in diabetes. Second, we need to move care away from the hospital and clinics and into the community and homes. We have to meet people where they are – as in, literally, where they live – so we can understand their needs and intervene early. Mobile technology is allowing us to enter people’s homes to conduct health assessments and then to send those results instantly to providers. But the essential part is being in the home – the personal engagement – to motivate patients to behave in ways that they wouldn’t behave otherwise. That’s the Holy Grail of health care. What does this approach mean for diabetes? Let’s take a fictional 62-year-old women named Mary who has type 2 diabetes and lives by herself. She sees her doctor only twice a year, and those visits last 15 minutes. But her neighbor Stacy visits her every two weeks to ensure that she is taking her medicine, has enough food, and is testing her blood sugar. Stacy is hired by Mary’s insurer and is qualified to conduct health assessments. As a neighbor, Stacy knows Mary and is trusted by her. Equipped with a smartphone, Stacy sends health data to Mary’s insurer and doctor. She also scans the house for loose rugs, broken thermostats, and other problems that could lead to an emergency. She asks Mary how much she’s been sleeping, does she have fruits and vegetables in the house, what are her biggest worries – inquiries that allow us to track how Mary’s health plan is working. One day Mary tells Stacy that since her foot started hurting, she hasn’t been able to take her daily walk to the park, where she reads her book. So, Stacy drive Mary to the local pharmacy, which has been equipped with an urgent care center. The doctor examines the foot and recognizes early-stage diabetic neuropathy. By more aggressively controlling her blood sugar, Mary can reverse the problem, sparing her from painful long-term complications, including possible amputation, and saving the health care system hundreds of thousands of dollars. Which is fine by Mary but is not likely to motivate her. The specter of some future health calamity rarely changes behavior. In Mary’s case, she mentions the foot in the first place because she wants to walk to the park to read her book. In short: It’s not about the foot. It’s about the walk. That’s what matters to her, that’s what motivates her. You need to meet people where they’re at. The engagement needs to be personal and focused on what matters to the patient. In the current system, the “walk” doesn’t even make the agenda because no one in the system asks about it or even knows about it. Mark also believes that individual communities should be centers for health care, and that idea was the driving force behind CVS’s acquisition of Aetna. As Mark envisions it, CVS’s 7,700 retail pharmacies need to be completely remodeled into community health centers – no more consumer items, save health and beauty products, but a place where you can get a CT scan, be fitted for knee brace, or have any one of many health needs cared for. This is, to be sure, extremely ambitious and will take many years to develop, but if you’re interested in a new model for diabetes care, Mark’s approach makes as much sense as anything I’ve seen. I admire Mark for many reasons, but none more than this: Aetna was a thriving company that was founded before the Civil War – and Mark sold it. To be sure, he banked a lot of money on his way out (he was a major shareholder), but for a blue-collar kid who grew up in Detroit, Mark was already rich beyond his dreams. By selling Aetna, he lost his job and his perks and all the prestige that comes with being a CEO. But he made the move because he’s seen the numbers – the rising expenses, the costlier therapies, the aging population, the government inertia – and he will tell you that our health care system is not sustainable. As a longtime health care executive and as a patient with significant needs, he knows better than anyone that the system is broken, and the costs are going to swamp the payers, private and public. Ultimately, the patients will pay the price, so something bold needs to be done. I hope Mark’s ideas get a good hearing, and I wish him well.